The object comprises a vertical steam engine and compressor on a single base with the flywheel in the centre. It is painted dark green. The compressor was designed to produce cooling equivalent to that produced by melting 5 tons of ice per day, equivalent to power of 17.6 kW. The maker's plate displays the manufacturer's name, C A MacDonald of 63 Pitt Street, Sydney, and the brand name Hercules. The Pitt Street address was MacDonald's office. The machine was made by Charles Arthur MacDonald at his foundry in the inner Sydney suburb of Ultimo. Hercules compressors were made in a range of sizes, with output between half a ton and 250 tons of ice per day. Those directly driven by steam had an output between one and 36 tons of ice per day, so this 5-ton compressor is quite small. The largest one in Australia, with output of 240 tons, was installed at the Melbourne Markets. A British citizen, MacDonald patented novel ammonia valves and other refrigeration system components while living in the USA. In the early 1880s he co-founded the Hercules Ice-Making and Refrigerating Machinery Company to manufacture compressors and other refrigeration equipment at the Hercules Iron Works in Aurora, Illinois, USA, then a town near Chicago and now a suburb of that city. The company exported machinery to several countries, including Australia. In 1893 Hercules supplied cold storage and ice to exhibitors at the Chicago World's Fair from a building it erected on the site. While not officially an exhibitor, the company allowed visitors to inspect the works and use the ice-skating rink on the fifth floor. To make the building look less industrial, the chimney stack was enclosed in a wooden tower, but the company omitted to include the architect's solution to the safety issue this created, an asbestos-lined wrought iron shield between the chimney and tower. Several fires broke out and were quickly suppressed, but these warnings went unheeded and the last fire led to the deaths of twelve firefighters and three civilians. MacDonald was one of four men held over by the coroner to be tried for criminal negligence, but all were absolved of blame soon after. In 1894 MacDonald was invited to Australia by the Sydney company, Hudson Brothers, as consultant for to build meat chilling and freezing works in rural areas. He remained, making a fresh start as an importer, exporter and manufacturer. MacDonald also had interests in Australian ice-works and meat-works and later in mining. In 1898 the Hudson Brothers' factory in the Sydney suburb of Clyde was taken over by Clyde Engineering, which carried out a wide range of work including the assembly of Linde refrigeration compressors for engineers, Wildridge & Sinclair (see for example photograph 88/289-571). Other competitors were James Budge (see compressors 94/76/1:2) and Waugh and Josephson (see steam engine 2000/51/1), who both began making ammonia compressors in Sydney in the 1890s. MacDonald imported refrigeration system components such as pumps and pipes from the USA and Britain. He maintained offices, and manufacturing or assembly operations, in Chicago, Durban, Buenos Aires and Wellington as well as in Sydney. Newspaper reports in 1904 of a Sydney fire, state that MacDonald had a large foundry on the corner of William Henry, Jones and Parbury Streets in Ultimo. This suggests that he was manufacturing compressors and other refrigeration system components in Sydney. The fire, confined to the roof timbers, was soon extinguished. In 1909 C A MacDonald became a limited company, and it was restructured in 1910 as MacDonald Hercules Ltd. In 1911 it amalgamated with the Sydney Hydraulic and General Engineering Co, which was then in liquidation, to become Hydraulic Engineering and Hercules Ltd. 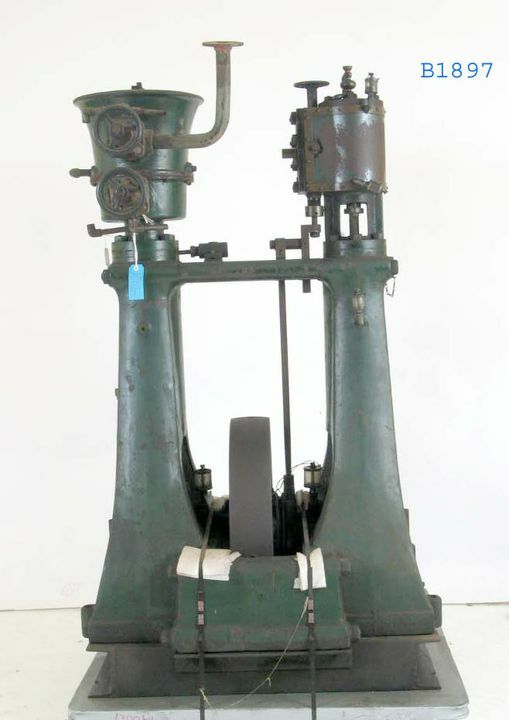 The Hercules assets included patents, drawings, patterns, plant and tools, confirming that MacDonald was making a substantial portion of his machinery in Sydney. The company published the 'Hercules Creed' in a booklet held by the State Library of NSW. This includes the following: design the best machine possible, with ample strength and efficiency; build a machine that pleases the eye; and use the best materials and workmanship for the machinery and other plant. The Sydney works supplied Hercules compressors and refrigeration systems across Australia, to Samoa, Fiji and New Zealand, and to ships owned by the Union, North Coast and Adelaide Steamship companies. Its machines were used by butter factories, breweries, meat-works, by makers of biscuits, soap and candles, and for cold storage of fruit. In 1913 the company was taken over by electric lift manufacturer, Standard Waygood, which became Standard Waygood Hercules Ltd. In 1920 this company changed its name to The English Electric Company of Australia Ltd while retaining its expertise in lifts and refrigeration. The compressor was used for teaching purposes at Sydney Technical College in Ultimo, a short distance from where it was made. Refrigeration was essential in many Australian industries, and the opportunity for trainee technicians and engineers to work with such a key machine would have helped equip them to make and install refrigeration systems and maintain them in good order. The object was donated to the Museum in 1970 by Sydney Technical College.